On Late Style, the second book by Edward Said to be published posthumously (after Humanism and Democratic Criticism in 2004), is a book about an intriguing subject - one that Said, although he left behind an unfinished manuscript tidied up in this book by his friend Michael Wood, had been thinking about for many years before his death - "the relationship between bodily condition and aesthetic style." "Does one grow wiser with age," asks Said, "and are there unique qualities of perception and form that artists acquire as a result of age in the late phase of their career?" In his introduction Wood - himself a critic of exceptional powers, and a writer in my opinion of more exciting prose than Said - elucidates what the awareness of impending death does to human beings. "[D]eath does sometimes wait for us, and it is possible to become deeply aware of its waiting. The quality of time alters then, like a change in the light, because the present is so thoroughly shadowed by other seasons: the revived or receding past, the newly unmeasurable future, the unimaginable time beyond time." Said's idea is to show how the work and thought of some artists near the end of their lives "acquires a new idiom, what I shall be calling a late style." It is an intriguing project with a powerful central thesis, and certainly Said finds some good approaches towards his material in his long introduction. He says, for instance, that while some late works reflect "a special maturity, a new spirit of reconciliation and serenity" (Shakespeare's romances are the paradigmatic example), there are also striking examples of artistic lateness "not as harmony and resolution but as intransigence, difficulty, and unresolved contradiction". In late Beethoven, for instance, there is a eccentricity that speaks "of a self-imposed exile from what is generally acceptable" that appears to derive from his own awareness of an exile soon to come. These are good, persuasive thoughts, but overall this is a somewhat clunky book. Some of this of course owes to the fact that it was unfinished at the time of Said's death (many reviews therefore felt compelled, somewhat pointlessly, to consider the book itself as an example of the subject it dealt with). My guess is that while it was not quite manuscript standard, nor could it be denied to Said's considerable audience both among university audiences and lay readers worldwide. But I found it hard to derive much pleasure from this book. Even the introduction, where some of the best writing is to be found, is bogged down by a long and circling discussion, not always germane to the subject, of the life and work of the German theorist Theodor Adorno, whom Said admired immensely - indeed, in this bit of the book Adorno seems alarmingly to be almost a lens through which Said sees the world, and some of the praise dished out seems decidedly peculiar ("He opposed the very notion of productivity by being himself the author of an overabundance of material…"). Much more important that commitment to a cause, much more beautiful and true, he says, is betraying it, which I read as another version of his unceasing search for the silence that reduces all language to empty posturing, all action to theatrics…. [H]e entered the Arab space and lived in it not as an investigator of exoticism but as someone for whom the Arabs had actuality and a present that he enjoyed and felt comfortable in, even though he was, and remained, different. In the context of a dominant Orientalism that commanded, codified and articulated virtually all Western knowledge and experience of the Arab/Islamic world, there is something quietly but heroically subversive about Genet's extraordinary relationship with the Arabs. "Orientalism" - that word appears in this paragraph almost as a slur, and perhaps Said's most permanent contribution to scholarship is that he should have changed almost singlehandedly, with his 1978 book by the same name, the established meaning of a word which had been in use for centuries to refer to an academic discipline that centred around the study of Oriental cultures and languages. Said charged, instead, that Orientalist scholarship was for the most part a discourse that reinforced established stereotypes of "the Orient", and was thus indirectly complicit with Western colonialism, which was based on an assumption of Western superiority and a contempt towards "the other". The book attracted sharp criticism almost from the very beginning, but its influence within the academy was so huge that it soon generated a mini-industry of scholarship advancing Saidian ideas. "Whatever its flaws," the scholar Malise Ruthven wrote in an obituary for Said in 2003, "Orientalism appeared at an opportune time, enabling upwardly mobile academics from non-western countries (many of whom came from families who had benefited from colonialism) to take advantage of the mood of political correctness it helped to engender by associating themselves with 'narratives of oppression', creating successful careers out of transmitting, interpreting and debating representations of the non-western 'other'." From my personal experience of six years studying the humanities at two different universities, I would say this is correct, and it is my opinion that Said's influence was mostly for the bad, not least in the field of literary criticism, where (although Said was himself a critic of the highest class) it has generated a great deal of obtuse, tendentious work. But the revisionary sense attached by Said to the word has now become pervasive. Understood as part of a larger imperialist project, "orientalism" has, in a decolonized age, now become an attack word for the other side, as it were. Readers interested in understanding this debate in greater detail might want to turn not only to Orientalism but also to a good recent book, For Lust of Knowing: The Orientalists and their Enemies, by the scholar Robert Irwin. Irwin's book takes issue with Said's thesis, and supplies an account of the great wealth of valuable scholarship done by the Orientalist scholars - Edward Pococke, Silvestre de Sacy, Hamilton Gibb - of the nineteenth and twentieth centuries. It is, writes Irwin, "mostly a story of individual scholars, often lonely and eccentric men" working without institutional backing. "Since there was no overarching and constraining discourse of Orientalism, there were many competing agendas and styles of thought. Therefore this book contains many sketches of individual Orientalists - dabblers, obsessives, evangelists, freethinkers, madmen, charlatans, pedants, romantics." Irwin's work on the subject is not easily available online, but here are some essays on Said and Orientalism by other good writers: Christopher de Bellaigue's review-essay "Where Edward Said was wrong", the Australian academic Keith Windschuttle's essay "Orientalism revisited" some years ago in the New Criterion, and Charles Paul Freund in "The end of the Orientalist Critique" in Reason. 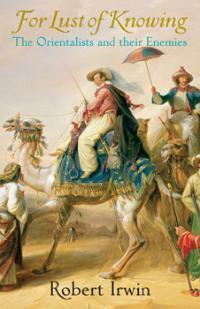 Said's 2003 essay on the 25th anniversary of the publication of Orientalism can be found here. To return to late style and Said's own work, here is an essay by Said, "The Rage of the Old", that advances some of the ideas in On Late Style. Said, Ruthven writes, "was better at elucidating distinctions than formulating systems", and some of this facility can be seen at work in a feisty essay from 2002, "Why The Many Islams Cannot Be Simplified" (this piece continued Said's long-running battle with the scholar of Islam Bernard Lewis). Two affectionate accounts of the enormous range of Said's life and work can be found in these obituary essays from 2003 by Michael Wood and Christopher Hitchens. Irwin is also the editor of a very good anthology of classical Arabic literature, Night and Horses in the Desert. An essay by him on Kahlil Gibran can be found here. And finally, an old Middle Stage essay about the sense of dimming life force and impending death in the work of two early twentieth-century novelists: "Life winding down in Cather and in Saratchandra". Other than that, a sparkling post. I look forward to finding "On Style" at my local library soon! How on earth did he make the leap from one to the other? 2. Why do you consider it pointless for the book to be seen as ‘an example of the subject it dealt with’? It seems to be a valid way to read the book. 3. Ah—Orientalism. :-) I know scholarship exists, that tries to frame an opposite view, that of the Occidentalist. But I don’t know very much about it. TBS - Sharp, very sharp. You clearly have poor Windschuttle all pinned down left to right. But I think the essay I've cited is a good essay; readers must judge for themselves. Windschuttle has his own website at www.sydneyline.com. Space Bar - With regard to your second question, I said what I did because I don't think there is any sort of evidence in the book for a distinct "late style" in Said's work, unless it to say that it seems scattershot and unfinished. The argument applies to artistic production, but it's a long stretch to take extend it to a work of literary criticism bringing together essays written at different times. "Much more important that commitment to a cause, much more beautiful and true, he says, is betraying it..."
Here, as I understand it, Said is saying that the most heroic position is not that which merely supports a given cause, but one which reserves the right --and is brave enough-- to betray it, ie. to show up the shortfalls of the "cause" in its hypocritical actions or attendant ideology, to critique it, as Said himself had done in his public criticism of Arafat. "...which I read as another version of his unceasing search for the silence that reduces all language to empty posturing, all action to theatrics…." Ie., the critique of the shortfalls a cause, or a movement, or an ideology, no matter how politically correct it may be, is one that in a sense shows us that no statement or position [as expressed, inevitably, in language] can be all encompassing or without a shortfall-- thus, this points us finally to the very inadequacy of language itself, and of actions too, and questions the very possibility of the perfect political position or action. This makes sense to me at least. Equivocal - That is a persuasive reading of Said's remarks on Genet. But it sounds more persuasive coming from you than it does from Said or Genet - you've unpacked its meanings rather well, but it sounds a great deal more glib in the original phrasing, and surely this is not irrelevant. Also, in Said's phrasing there are two things, one - the issue of politics you deal with - being "another version of" a very large claim. I feel a rather complacent smugness radiating from "the silence that reduces all language to empty posturing, all action to theatrics". I don't feel from my experience that this is anywhere close to the truth. Well, yes man, at least the words pinned -- for me -- that ambiguity and emptiness I have sometimes felt in the middle of, say, a particularly theatrical protest march. But you may be right in identifying Said's unconscious absorption (perhaps-- in this passage) of that grandstanding, all-or-nothing, gestural tone that is de rigeur in French arts and letters. And I suppose I should read the essay before I say any more! orientalism - a book which corrected my perspective - helped redeem my self respect - decolonised me intellectually, academically, psychologically.not sutprised at the cynicism in some of the resopnses quoted by you. Regarding occidentalism - only point no.2 holds true in the fundamentalists' discourse about the east. occidentalism is essentially an effort at subversion of the grand narrative of the west, by the group that was othered in the western discourse about the east. Zaid in his Late style makes an intersting observation about late style of an aesthetic culture too - he attributed postmodernism to the late style of western creativity and aethetics!! !